In human nature, we prefer to think of ourselves as proactive rather than reactive. To be reactive implies that there has been no initiative about the action, and in terms of manufacturing plants, it is letting the equipment set the agenda. With regards to plant maintenance, many companies are still reacting to the condition of their plant rather than being a step ahead. In an environment where most businesses are facing increasing cost, product quality and competitive pressures, there is an ongoing need for UK manufacturing operations to improve productivity and reliability. As a result, it is ever more important for companies to be ahead of the game by proactively managing the service and maintenance of plant and equipment. Not only this, there are additional pressures surrounding corporate goals to reduce costs and maximise ROA. The advantages of preventative maintenance are clear-cut; by being ahead of the game, plant managers will see an overall improvement in their plant’s operating performance, a reduction in total cost of ownership (TCO) and a reduction in unscheduled downtime. So what are the key types of plant risks and failure modes that can occur in manufacturing plants using chemical processes for surface finishing? There are three main types of plant and equipment associated with surface finishing: automated lines; manual lines; and fume extraction systems. Typical automated or manual process lines include: cleaning lines; chemical etching lines; electroless plating lines; electrolytic plating lines; hard anodising lines; chromic anodising lines; tartaric sulphuric anodising (TSA) lines and conversion coating lines such as alocrom and phosphating. Fume extraction would then be used to control pollution, emission and biological monitoring to fulfil specific requirements, and these tend to be bespoke. For each type of plant outlined, there are a number of general risks and failures modes that can apply. If process tank integrity fails then the risk of aggressive chemistry flooding would present a major health & safety and environmental risk. For example, chloride stress corrosion cracking (CLSCC) is one of the most common reasons why austenitic stainless steel pipework and vessels deteriorate in the chemical processing and petrochemical industries. Tank failure can result from a combination of causes such as residual stress from fabrication and welding, a rough surface finish leading to a long period of slow localised corrosion and short periods of rapid crack growth when the temperature hits a certain level during cleaning cycles. Failure can also originate from equipment overheating through failure of the heating and cooling elements. This also presents a fire risk, which is incredibly dangerous in facilities where chemistry is involved, often resulting in critical damage to the plant and the building in which it is housed. The chemicals themselves present their own risk. Any process that involves chemical handling can lead to leakage and spillage from failed pipework, valves or pumps, which can damage parts of the plant and/or adjacent equipment that is not already protected from chemical ingress. Additionally, chemical spills from poorly maintained plant and equipment can pose a significant health & safety risks to operators in the area. Wear and tear is one of the most common failure modes in any type of machinery, especially when there are moving parts involved. For example, we tend to see excessive wear and breakage in components such as lifting belts and wheels in transporter lines due to a lack of servicing and maintenance whilst in air extraction systems, a lack of cleanliness can often cause premature wear and failure of the drive belts and bearings in extractor fans. Faulty or poorly maintained fume extraction equipment can also lead to a serious threat of legionella, again implicating the health & safety of employees. These risks can often turn to reality through the failure of gauges, monitoring sensors, heating and cooling devices in process plant. Regular, planned maintenance and servicing can eliminate costly unplanned downtime resulting from the failure of these plant critical components. External factors are putting many companies under pressure to maximise production capacity and improve product quality while trying to cut their overhead costs at the same time. Over time, this has put more pressure on maintenance departments to maintain the reliability of critical or more complex process plant and equipment. Recognising that these challenges are often compounded by increasingly stringent health & safety and environmental regulatory compliance, forward thinking manufacturing companies are developing a more proactive approach to plant asset maintenance. Reactive maintenance is often known as ‘firefighting’, and is sometimes as risky as the original denotation of the word. This break-fix approach is not an ideal strategy and its use is often driven by economic pressures. However, this is a false economy. A typical scenario would be to operate the machinery until a failure occurs. It is only at this stage when the appropriate repairs are made, and this tactic can incur extreme costs through critical machine failure and lost production output resulting from unplanned downtime. In today’s manufacturing environment, competition, environmental and health & safety implications make this route challenging with the increasing preference being towards taking a preventative maintenance approach. Generally speaking, where there is risk there is an accompanying regulation, and plant and equipment maintenance is no exception. Maintenance on plant and equipment is carried out to prevent problems arising, to correct faults and to ensure equipment is working effectively. Although production and profitability are high on the agenda for responsible companies, health & safety is equally important. The Health and Safety Executive’s (HSE) Control of Substances Hazardous to Health (COSHH) regulations play a key role in this area, and in particular the Provision and Use of Work Equipment Regulations 1998 (PUWER). Ultimately, preventative maintenance protects operators and employees from risk of injury, for example from lifting gear falling and chemical spills, leaks and fires. The condition of plant and equipment is also affected by the Industrial Emissions Directive (IED), which influences the environmental responsibility of companies. The IED is the successor of the IPPC Directive and in essence, it is about minimising pollution from various industrial sources throughout the EU. These regulations link back to the operation of air and fume extraction equipment. For example, if there are any faults in the mechanical parts, dangerous fumes and gases could leak into the atmosphere. With regards to the water treatment in plants using a surface finishing process, the Environment Agency drives the ‘Consent to Discharge’ regulations under the Water Resources Act 1991 (as amended by the Environment Act 1995) for companies that wish to discharge effluent into inland freshwaters, coastal water or estuaries and ground waters or land. Should a company be using water treatment systems, these will need to be heavily regulated to ensure that the water levels are safe. For example, referring back to the chemical risks involved of surface finishing, if the equipment is damaged or worn this could have contamination implications. The primary goal of preventative maintenance is to prevent the failure of critical, more complex or higher capacity equipment before it occurs. It is a strategy designed around time-based, usage or condition-based activity to preserve and enhance equipment reliability, replacing worn components before they fail, and which includes: critical process equipment checks; partial or complete overhauls at specified periods; oil changes; filter changes; and lubrication. In addition, engineers record equipment deterioration so that they know to replace or repair worn parts before they cause systems failure. It is the most cost-effective way of extending the lifecycle of existing machinery and is a small fraction of the cost of production disruption and associated customer dissatisfaction. Other key benefits of implementing a preventative maintenance strategy include the fact that businesses will avoid unplanned plant shutdown and disruption to productivity, thereby improving overall equipment effectiveness (OEE). Early inspection also helps identification of wear and tear to allow for replacement before breakage or failure as well as complying with various insurance requirements. So what process plant functional areas would typically be tested? For mechanical operations, strict testing would be carried out to assess the general wear and tear on all moving parts, such as lid assembly, carriage/transporters and extractor fans. Similar tests are carried out on the tank structure. Then for electrical, control and automation, it is important for tests to be carried out on gauges, monitoring sensors and control devices to ensure that they are all operating accurately. Current feeds will also be tested to ensure that they are maintaining the correct safe levels, and cabling and trunking needs to also be inspected to make sure it is intact. However, a lack of sufficient in-house maintenance resources coupled with the lack of necessary skills and experience can often be a barrier to improving service and maintenance activity for industrial process plant. Acquiring the necessary regulatory knowledge, mechanical, electronic and IT skills may need regular investments in employee training or, alternatively, the outsourcing of service and maintenance contract to a specialist company. There are different levels of service and maintenance outsourcing support available in the market. As a leader in the supply of metal surface treatment process plant, NHE offers a holistic approach in the form of a tiered structure suited to different requirements. A premium plus programme would be tailored towards manufacturers with critical operations, when downtime is not an option. This includes all aspects of service and maintenance including guaranteed emergency breakdown support, consignment stock for critical spares and remote, condition-based diagnostics where applicable. The premium level is suited to manufacturers that require the additional security of emergency cover. This maintenance programme has been designed to ensure the minimal possible downtime and includes recommended spares lists and the option of consignment stock for critical spares. There is also a basic level of maintenance support available to companies, which is designed to provide an annual plant service and ensure correct operation and calibration, while at the same time checking the plant for wear and tear. Prior to an external evaluation, there are also a range of checks that plant managers can carry out themselves to maintain the general upkeep of their facilities through inspection of condition and cleanliness of equipment. Additionally they should be following operation and maintenance instructions that are provided with the plant itself. All critical plant assets should be regularly serviced and maintained to improve manufacturing performance and avoid unplanned downtime and unnecessary maintenance activity and costs. A wide range of industries are already benefiting from taking a proactive approach to the maintenance and servicing of plant due to the OEE benefits and reduction in costly unplanned downtime as well as adhering to the increasingly stringent regulatory compliance requirements that put pressure on manufacturers. 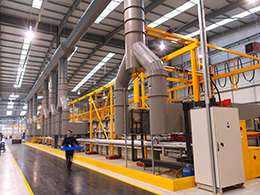 The truth is, most manufacturing facilities would benefit from a well-executed, planned maintenance programme and, where they are operating critical, complex or high capacity process plant, they could find this strategy is enhanced by outsourcing critical service and maintenance activity to a specialist supplier. For typically less than a few per cent of the capital cost of process plant investment, the business case for preventative maintenance services should be easy to make. Mike Priddle is managing director at NHE.